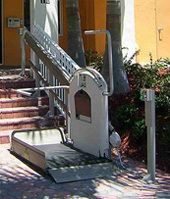 For the past three decades, Garaventa Lift has pioneered the use of inclined platform wheelchair lifts. This innovative equipment provides accessibility for people in wheelchairs and those who have difficulty using stairs. Garaventa Lift has tens of thousands of inclined platform wheelchair lift installations in public buildings and private residences all over the world. 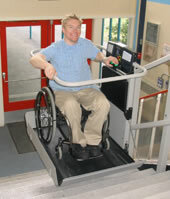 We have been manufacturing, installing and servicing wheelchair lifts since 1979. Our inclined platform lifts are custom designed and manufactured in North America by the most experienced team in the world. The Artira is an inclined platform lift designed to carry passengers up and down straight or curving stairways, over flat landings or over spiral staircases. It features Smart-Lite technology, an innovative feature which makes it the easiest inclined platform lift on the market to use. It guides the user through the sequence of operations. The control buttons illuminate to indicate the next logical step. For example, after you approach a folded lift and activate the call station, the "Unfold" button will illuminate, indicating to the user that this is the next function that is most likely desired. All other functions remain active. The Artira also offers the optimum in design flexibility. Put our team to work for you. Combine innovative products with experienced product designers to solve any accessibility issue. The Xpress II inclined platform wheelchair lift is an ideal accessibility solution for straight stairways with two landings. It can be mounted on either side of the stairway, depending on the stairway design and location. 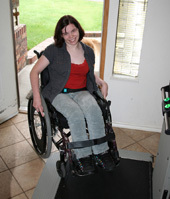 These wheelchair lifts can also be installed with little or no structural modifications. The Xpress II is powered by the building mains power and is available with either battery backup for full operation in a power outage or battery-powered emergency lowering. It is the most robust straight incline platform lift available and is suitable for heavy-duty commercial applications. The X3 inclined wheelchair lift is an ideal accessibility solution for straight stairways within a home or in light-use commercial applications. The X3 inclined wheelchair lift is powered by rechargeable batteries. The batteries are charged when the lift is not in use and is parked at one of the landings. The call station wall controls are wireless, making the installation of the X3 cleaner and simpler than traditional hard-wired wheelchair lifts. No need to install unsightly conduit on the walls to the call stations. The X3 inclined platform lift can be installed with little or no structural modifications, usually within a single day. The X3 is accessibility simplified!